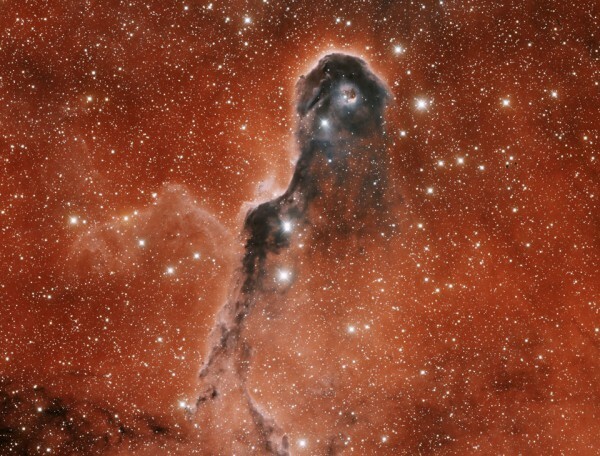 Nebula elephant trunk, located about 3,000 light years away from Earth is a curious mass of ionized gas is only a mass of star birth. In fact, the “eye”, located upstairs, is nothing but a star that exploded and the gas emitted by this star linked with stellar winds have created this curious way. The stars that form this nebula are very young and why infrared is that there is much still loose around gas which is the form the following stars in the next million years. So it is full of what is called “protostars”. A protostar is, as the name suggests, in itself is the beginning of a star. An accumulation of gas, gravity is starting to focus on one point. The way to begin a star (created, come on) is usually the external gravity pulls and forces to join a mass of gas and, from there, the very seriousness of the united gas to the external drive makes it go condensing and having a center where they begin, the molecules banging each other and heated. Protostars are easy to see. When starting to warm up, they emit much more “hot” than the infrared cosmic background radiation. As gas is surrounded mainly all we can see is that infrared radiation is the only one that is able to “pass” in the interim gas. There are several “levels” of protostars depending on their age and, above all, the level that captures infrared. Here I will not give barrila and I recommend you to look at the Wikipedia, that’s what the people write.